by the Lunar and Planetary Institute to educational institutions. ALTA, designed by LPI scientist Allan Treiman, is a rugged, simple classroom instrument, designed to help students learn about light, color, and spectroscopy. Using the spectrometer, students can easily and rapidly collect data on the proportions of colored light (including infrared) that reflect from real-world objects. Data can be calibrated against standards and manipulated into graphs of reflectances versus light wavelength that are nearly identical to those in text and reference books. The spectrometer uses light in visible colors (blue through red in seven wavelengths) and in four invisible "colors" of infrared light. The results are good models of spectra from NASA probes like Mars Pathfinder and environmental satellites like LANDSAT. The spectrometer can be used in any class that deals with light, color, or spectroscopy. Curriculum materials include basic operation instructions and exercises in biology, environmental science and remote sensing, geology and planetary science, and physics. Extensions are suggested for astronomy, physiology (color vision and illusion), and art. The spectrometer and activities are designed for grades 8 through college, and they have been used with middle school gifted and talented classes. The ALTA® Reflectance Spectrometer is ideal for open-ended student research. General Description: The ALTA Reflectance Spectrometer® is a classroom instrument designed to allow students (grade 5 through adult) to learn about visible light, invisible light, the origins of color, and the value of reflection spectroscopy of light in remote sensing applications. Using the ALTA, students themselves can measure the reflectances, i.e., the proportions of incident light that are reflected, from materials of their own choosing. With ALTA, reflectances can be measured in eleven colors of light, blue through infrared. Measured reflectances on suitable surfaces are typically within a few percent of laboratory values. The ALTA is suitable for classroom demonstrations and laboratory investigations in biology, geology, planetary sciences, and physics. The ALTA has been used successfully in several science fair projects, one of which won state-level honors in Texas. Suggested Applications: The ALTA spectrometer is useful wherever reflection or scattering of visible or near-infrared light is important. We have used it successfully to demonstrate the properties of light and color, the existence of invisible (infrared) light, data collection and the scientific method, and the value of remote sensing spectroscopy in planetary and Earth science. The ALTA is particularly useful in Earth System Science, as its wavelength bands are similar to those of most Earth Observation imaging systems, like LANDSAT MSS, LANDSAT TM, SPOT, and some of AVHRR. The ALTA has been used to obtain "ground-truth" reflectances to aid in classroom interpretation of LANDSAT images. The classroom lesson plan booklet and teacher's guide contains detailed instructions for lessons in these and other remote sensing applications. Noteworthy applications include soil moisture, water turbidity, clouds and dust, why Mars is red, and the inverse square law. 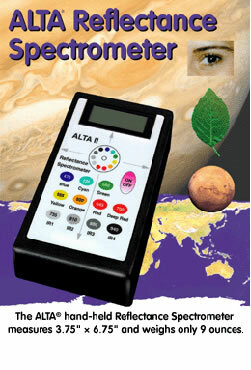 Detailed Description: The ALTA spectrometer is patented under patent number US #6,043,893. Technically, the ALTA is a multiband photometer rather than a spectrometer, because it does not measure reflectances across a continuum of wavelengths. Rather, it measures reflectances in separate, nonoverlapping ranges of wavelength. However, this distinction is not important for most classroom applications. The ALTA consists of three basic elements: colored lamps, a photo-detector, and a digitizer and digital display. These three elements are arranged and coordinated with the sample and with each other to provide reproducible, easily interpretable results. Colored Lamps: Switches on the face of the ALTA turn on colored lamps that illuminate the sample being analyzed. Each switch is color-coded for the lamp it controls, and is labeled with the wavelength (in nanometers) of its lamp. The eleven lamps are light-emitting diodes (LEDs) in the colors blue (470 nm), cyan (525 nm), green (560 nm), yellow (585 nm), orange (635 nm), red (660 nm), deep red (700 nm), infrared 1 (735 nm), infrared 2 (810 nm), infrared 3 (880 nm), and infrared 4 (940 nm). 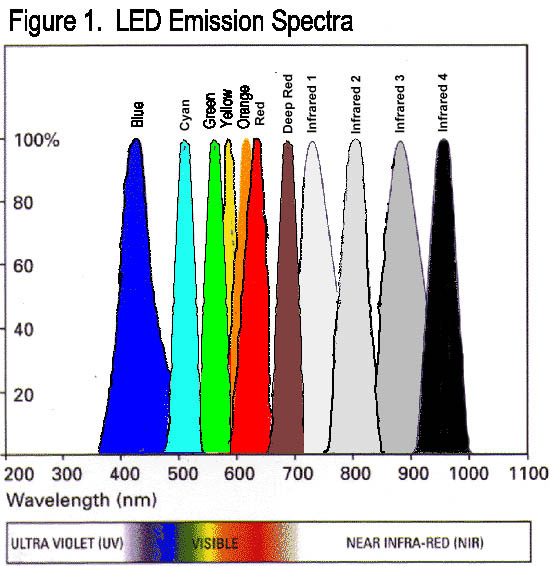 The lamps are not monochromatic, but emit in a wavelength range where emitted intensity is half the peak intensity at ±10–25 nm from the peak emission wavelength (Figure 1). The LEDs are arranged so that their light passes through the hole on the bottom face of the ALTA and onto the sample being measured. In this configuration, the ALTA works best and most reproducibly with flat objects that have matte surfaces. Some shininess (as in most leaves) is acceptable — mirror-like surfaces will yield spurious readings. For moderately rough surfaces, as in basalt lava rocks, the ALTA yields reasonable values for reflectance, provided that the rock surface covers the full field of view from the circular hole. With very rough rocks, light leaks can be a problem. Some users have added a spongy gasket around the circular hole to stop light leaks. Photo-Detector: The ALTA senses reflected light with a silicon photodiode. Light from an LED lamp interacts with the sample, and the reflected (scattered) portion is detected by a silicon photodiode positioned among the lamps. The diode is most sensitive in the infrared near 1000-nm wavelength. To produce comparable output readings from the ALTA in all wavelength bands, the intensity of each lamp is adjusted in the factory. Digitizer/Display: The voltage output of the photodiode circuit is digitized using off-the-shelf A-D integrated circuits, and is displayed as raw numbers on an LCD display on the ALTA's face. The raw output numbers are in tenths of millivolts (hundreds of microvolts) output from the photodiode circuit. By itself, this number is only a qualitative guide to whether an object reflects a lot or a little of a particular wavelength. Converting raw output voltages to reflectances is simple, requiring only measurement of reflectances of a standard material (and a few arithmetic operations). The recommended standard material is a stack (2+ sheets) of white photocopy or computer paper. This type of standard reflects 90–95% of the light that hits it, evenly throughout the wavelength range measured by the ALTA, and is quite adequate for all but the most demanding applications. Reflectances of standards can be refined (although this is not necessary) by comparison with ALTA-measured reflectances of a calibrated material, like an 18% gray card used in photography.